Now, HAIM has a brand new album, Something to Tell You, with plenty of new well-written musical sentences, along with some stellar and varied production. Many reviews have been placing this new album squarely in the past, the basic premise being: the music itself doesn't have much new to say, but it is good music. 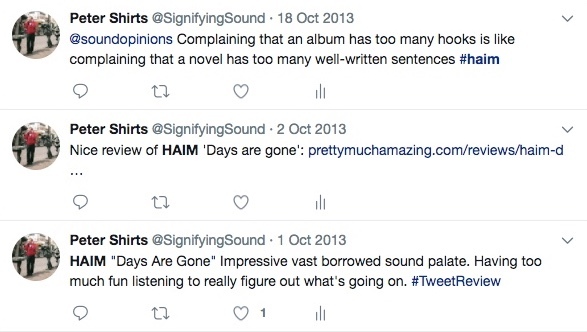 I think that is not quite right—Tom Breiham, in his Stereogum review, put it better, suggesting that "HAIM’s music doesn’t even belong to a genre" because it draws from so many influences and it constructs from these blocks meticulously and seamlessly. And what is new music, but reconfiguring things from the past? But like many music other reviewers, Breihan did not offer up many specific musical elements that were borrowed (though he did point out some little production gems). 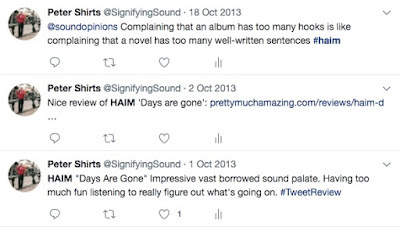 It's the comparative trap that so many music critics fall back to—using a band name comparison as a shorthand without explaining the connection, as if bands weren't multi-faceted. In “Little of Your Love,” there’s a great guitar line that is hinted at, but really only fully realized during the fade-out—leaving us feeling like they are conveying the message: “hey, this song is just as rocking as a we wanted it to be” and leading us to want more. In “Ready for You,” probably the catchiest song on the album, there are kind of two choruses (which forgives a somewhat uninspired 1st chorus that turns out to be a pre-chorus). In the “2nd” chorus, the vocal harmony parts are so well written, first staying high and then filling out the middle part for the title phrase “I wasn’t ready for you.” At the end of the bridge, there is a weird chromatic descending vocal part leading to a pretty trippy breakdown of the “2nd” chorus. Throughout the song, there is an amazing amount of space in the beat (especially in the verse) that allows for lots of playing—maybe this is what can happen when drummers write songs. “Right Now” starts out with what seems like a spare 4-beat, but when the harmony voices come in, you aren’t quite so sure—maybe the bass drum is hitting on beat 3, instead? Or maybe the song is in 3 instead of 4? The whole song keeps the listener guessing where the bottom of the beat is. According to an NPR interview, this song was actually designed to have all three HAIM sisters playing drums, which was their first instrument—the fluidity of the beat certainly lends itself to that. It is not often you hear that a pop song was developed to solve a musical or performance puzzle, instead of to express an emotion or thought. Finally, a general comment about the album: a close listen reveals a lot of vocal manipulation and sampling—pushing voices high, or low, autotuned, sped up, thrown into low-fi, made to sound like a guitar or extra reverb added for just one note (this alone should place the album squarely in the present). There is so much variation, I can’t help but think that every decision was purposeful. The instrumental decision are similar—several times in the album thick textures will fall away for a dramatic effect, leaving an instrumental texture we haven’t heard before. I don’t think this album has as many memorable moments or a well-written songs as Days Are Gone (and perhaps too many sudden endings), but Something to Tell You has musical as well as relationship message to convey and is still a great listen all the way through that keeps on giving. I recommend a listen.